Dan Pizzillo, my brew bro and homebrewing mentor, was recently elected president of the Malted Barley Appreciation Society based here in Brooklyn. MBAS was one of the first homebrew clubs that I joined when I started brewing and focuses on the appreciation of craft beer as well as homebrew. The meetings usually consist of a guest speaker from a commercial brewery or distributor who will bring some beers and discuss beer related stuff with the club. After that has concluded people pop open their homebrews and share them among friends and strangers alike. One of Dan’s first deeds as acting Prez was to schedule Garrett Oliver of the Brooklyn Brewery to host a meeting at their facility. He gladly accepted and took the club on a private guided tour with the brewery closed. 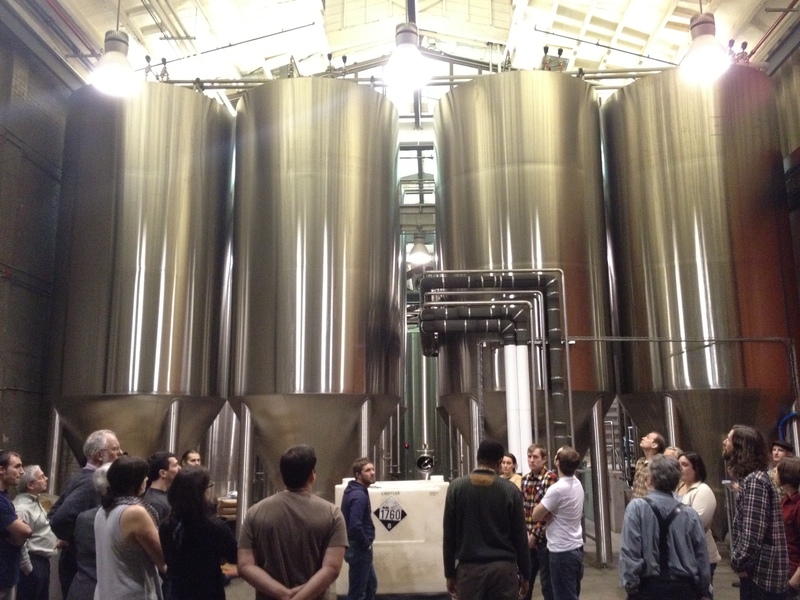 We got a glimpse of the old 25 bbl brewhouse along side the new three vessel 50 bbl system. They cannibalized the old boil kettle to act as a holding tank for hot wort, allowing them to brew multiple times a day without batches running into eachother. The most significant upgrade came in the form of multiple new fermentors, including several 200 bbl tanks, allowing them to boost annual output from 8,000 bbls to 50,000 by 2012. Combine this with the over 80,000 bbls contract brewed by FX Matt upstate and the amount of “Brooklyn” beer produced will make them one of the top 20 regional breweries in the United States. The most exciting part of the night was the “ghost” bottle selection that Garrett poured. These beers are usually one offs and test batches mostly for the brewing team that rarely make it out of the brewery for the public consumption. The first beer was a bottle conditioned version of Radius, which was originally meant to be served within a five block “radius” of the brooklyn, but later stretched to the entire borough of Brooklyn. Session strength and extremely drinkable, the carbonation from the bottle conditioned version provided much more elegant mouthfeel than the draft version and showcased the delicate balance between the all pilsner malt base and the spicy, floral Aurora (link to single hop aurora beer) hops. Fermented slightly cooler than normal (I believe he starts in the low 70s) using the Saison Dupont yeast strain, I’m pretty sure Garrett said it briefly made an appearance in bottle form for sale but couldn’t compete with much higher alcohol saisons that were similarly priced. The next beer was a sour Local 1 “spontaneously” fermented in a second use bourbon barrel with New York State wild yeast from grape lees sourced from Red Hook Winery. “Cuvee de la Crochet Rouge” stretches the definition of spontaneous fermentation that we associate with lambic brewing, but is a wild beer nonetheless. From what I understand, all Red Hook wines are made from Long Island grapes and ferment using only wild yeast present on the grape skins. Garrett mentioned a particular NY Times article about 90+ point wines are manipulated using science and almost never use wild yeast, the traditional old world way. Instead, the wild yeasts and bacteria are inhibited with potassium metabisulfite and then inoculated with a commercial wine strain for more predictable results. Much like the Red Hook wines, the beer was not inoculated in the customary way, using a commercial beer strain, but instead dosed only with the indigenous wild yeast from the grape lees. Fascinating stuff, and the beer was awesome, with my only gripe being the oaky bourbon flavor somewhat overwhelming the delicate sourness. The next beer was an early version of Mary’s Maple Porter, which looks like it will be released as part of the Brewmaster’s Reserve series. It was cool to get to a taste of this well balanced porter before its public release. Garrett had an interesting story about his experiments with constantly upping the amount of locally sourced maple syrup from a Brooklyn Brewery employee in order for it to show up flavor-wise in the final beer. Apparently, you need a lot. The final beer was a four year old Black Ops from the Brooklyn Brewery barrel room across the street. This beer was incredibly mellow and drinkable, even at 10%+ ABV. Surprisingly, it showed no signs of souring and oxidation was very minimal. Black Ops bottles have been hard to come across recently due to their small batch size and the increasing popularity in barrel aged beers, so if you come across some, pick up two bottles so you can enjoy one now and then cellar the other for four years to pair with Garrett’s recommendation of vanilla sauced sea scallops.